Science fiction is rife with tales of experiments that run out of control and blow up the planet or exterminate all life or something. 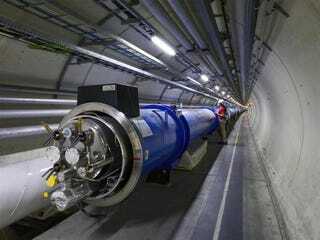 Maybe that's why two U.S. researchers sued the European Organization for Nuclear Research (CERN), trying to get an injunction that would prevent them from building their Large Hadron Collider. Their reason? Concern that it would create an apocalyptic mini-black hole here on Earth. Many debated whether their fears were pure cranksterism or held a grain of truth. Now a physics professor has researched the issue and discovered the truth about the LHC's inherent risks to all humanity. The chances of a microscopic black hole forming are impossibly small. Cosmic rays smash into particles all the time at very high energies. We probably would have noticed if the universe was being chewed up by an endless torrent of ravenous mini black holes. In the incredibly unlikely event that a microscopic black hole forms, it would exist for "a nano-nano-nanosecond." Not long enough to do any damage, in other words. Giddings even studied what would happen if a long chain if bizarre events occurred, and a stable micro black hole formed. The result would be...nothing much. Even a stable microscopic black hole would be harmless. To be honest, I'm kind of disappointed. Image by: CERN via Science Daily.